As if it’s the pregame before a lifetime of monumental choices, the pregnancy months constantly bombard expectant parents with a host of questions. Do you plan to nurse or bottlefeed? What kind of diapers will you use? What’ll the baby’s name be? Have you picked out the colors of his nursery? Where’s he going to college? Since most of those questions are beyond the scope of this blog, let’s look at the easy question. What color should you paint your baby’s nursery? 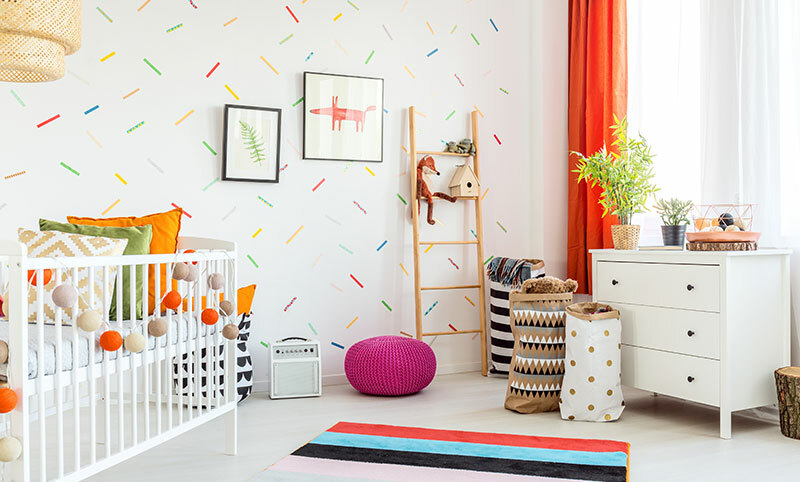 Thanks to decades of design research and centuries of color theory, today’s parents can avail themselves of the many advantages of color combinations to bless their baby with a nursery that’s perfect for their home, their family, and their budding personalities. Yes, personality. Babies’ personalities are evident even in the womb. You probably already know if your baby’s a wild child. If your unborn baby loves doing chin-ups on your collarbone, you can expect him to be a baby who’s a bundle of energy. Likewise, if you constantly worry whether your baby’s okay, only to have your OB or midwife reassure you everything’s fine, chances are you have a quiet dreamer. Both are wonderful, but knowing those personalities can guide your nursery choices. Color affects everyone. Since babies’ brains are blank canvases, color can be even more powerful. The subtle influence of a light periwinkle or a gentle yellow can set the stage for your child’s entire outlook on life, especially if this is a color scheme you won’t be changing until they move out. Not only does color affect your baby, but it also affects you, the parents. It might not seem like a big deal now, but you’d be surprised what a toll sleepless nights can inflict. When your head’s tingling from exhaustion and your back hurts, the flaming scarlet wall that looked so artsy two months ago suddenly amps your nerves, and poor baby suddenly has a scary looking parent glaring at him. Red is the power color. It’s the color of passion, of roses, of kisses, and of blood. It’s a bit much for a newborn when splashed generously, but a little can go a long way. Just as a bright red wall would be overkill, tasteful use of some red accents can balance out those blah colors like white, gray, and hospital blue to transform a dead room into a cheerful, tasteful space. Orange is the color of fast food. That’s because it’s proven that combinations of red and yellow make you hungry. If you anticipate a sleepy, sluggish baby that might have trouble gaining weight, orange could be a stimulating color to help you when he won’t wake to eat. On the other hand, if you have the chin-up baby, flee from orange. Stay away. Yellow is the happy color. Just make sure not to overdo it. Just like sunshine is necessary for life and happiness but our eyes can’t tolerate large doses, so is yellow best in small quantities. Located in the center of the spectrum, it’s the balancing color, so make sure the nursery has a yellow focal point somewhere. As the most prominent color in nature, it makes sense that green is the easiest on our eyes. It combines the cheerfulness of yellow with the mellowness of blue. Green is hard to beat. There is blue, and there is blue. My parents once painted their dining room the most depressing blue you could imagine. It lasted less than twenty-four hours. If you choose blue, look for one with a hint of green and as little gray as possible. You don’t want a brilliant royal blue unless you have plenty of white to counter it. Also, a good way to brighten an ugly grayish blue is to add cheerful accents of yellow, orange, or red. Purple’s an unnatural color, which is rarely found in nature. This is why it has traditionally been associated with royalty. Tasteful use of purple can be beautiful, especially when paired with rich, silky fabrics. It carries the same emotions as red and blue depending on which is more prominent in that particular shade. White in a nursery screams “Behold the domain of the perfect mother.” Since perfect mothers have been proven fictitious, white says you’re insecure and hiding something—like that spit-up stain under the glider. If you must choose white, be nice about it and don’t flaunt your perfection to visiting mommy friends. They’ll not visit as often. Brown’s a great color for a cowboy or farmer themed room. Even a rustic girly look works well with brown. Just make sure you keep things natural and not too sleek or perfect looking. My first baby’s nursery was light periwinkle blue with sheer white curtains. It was delightful. It felt cool in the hot summer, and just walking in was relaxing. My baby did turn out to be a calm, cool individual. Did it have anything to do with my color choices? I don’t know. I do know I would have treasured every moment with him no matter what color the walls were. Remember that, and enjoy the journey!